"We went camping a lot with our family. I found that pre-mixed items worked so much better for us. Yet I also found that I liked using them at home as well. Also my food budget made difference on what kind of milk I used for this as well." Mix cornmeal, flour, milk powder, baking powder, salt together in a bowl. Mix 2 eggs, 1/4 cup vegetable oil, 1/2 cup flour, and 1 1/2 tablespoons honey together in a bowl. 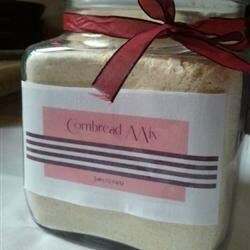 Mix 1 1/2 cup cornbread mix and 1/2 cup all-purpose flour in a separate bowl; form a well in the center. Add egg mixture to the well and stir to combine batter. Pour mixture into a greased 9x9-inch pan. Bake at 375 degrees (190 degrees C) until a toothpick inserted in the center of the bread comes out clean, 35 to 40 minutes. I had to eliminate the dry milk for allergies figuring that when mixing batter, soy milk can be added later. This worked out fine in the recipe I used! Wow!!! Thank you, so much. Great to have on hand.